For years, I had heard about a newspaper that once existed in New York City that carried no advertising. How could this be? I wondered. 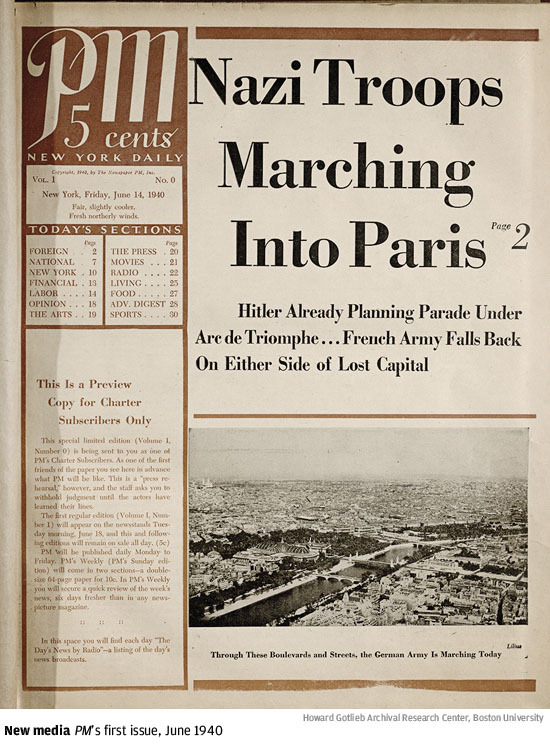 Years later, I had the chance to explore the history of that newspaper, which was called PM. For eight madcap years during the 1940s, PM defied many of the assumptions about the news media and offered New Yorkers a daily paper that was smart, funny, and avowedly left-wing. As it turned out, the paper’s founding editor was Ralph Ingersoll — one of the most important journalists of the 20th Century whom no one has ever heard of. To my great good fortune, it also turned out that Ingersoll decided to donate all his papers to Boston University. That’s where I caught up with them and discovered that Ingersoll was a great keeper of records and a serial drafter of his own memoir. The result is an article that I wrote for the Columbia Journalism Review, which posted it to the CJR website today. Enjoy. With havin so much content and articles do you ever run into any issues of plagorism or copyright infringement? My website has a lot of exclusive content I’ve either authored myself or outsourced but it looks like a lot of it is popping it up all over the internet without my agreement. Do you know any methods to help protect against content from being stolen? I’d certainly appreciate it.